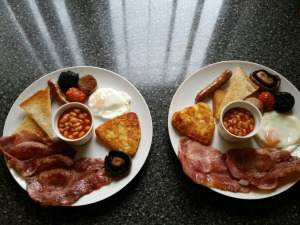 Castle Lodge B&B Bed & BreakfastYou will enjoy the wonderful rolling countryside and yet are very close to a world of attractions in glorious Southern Wales. Relax outside and take in the views or enjoy the scenery in the glorious countryside. Or why not visit, within easy walking distance the village’s 3 local pubs selling local Ale. Also a short walk away, there are 2 fuel garages, shop with cash machine. The village of Sennybridge offers a friendly atmosphere, so if you fancy a walk through the village, you will always see a happy and welcoming face… the village is also home to renowned Annual Agricultural Show. We look forward to your company, when you join us in our tranquil B&B found in the village of Sennybridge, Brecon Beacons. •Ample safe parking •Well equipped luxury accommodation •Spacious guest living room •Fully equipped kitchen for guest use •Home cooked meals, catering for all dietary needs •Excellent phone reception and Free WiFi •Satelite TV throughout •Full Size Pool Table •Dog walking service available Children welcome from any age. 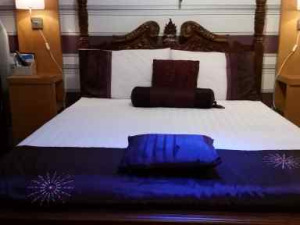 Spacious double en-suite suitable for singles, couples and families. All our rooms have quality feather filled duvets and pillows with pillow and mattress protectors, clean crisp linen and fluffy towels.Queen Anne Beds ..
take A40 from Brecon. Situated between 2 fuel station. Private road to Castle Lodge situated between the 2 garages. regular bus service along the A40. Bus stop situated in village.